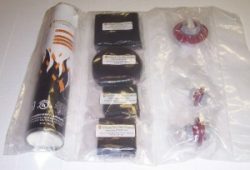 UNIQUE’s Automotive Firestopper Kit contains everything you need to firestop a race car or restoration. Keeps your driver safe longer in case of an engine fire. Helps protect your competition driver and equipment in case of an engine fire. We have assembled the three UNIQUE firestopping components required to properly seal the firewall of an average race car or restoration and we offer them as an economical kit. Ideal for NASCAR use. 1.) A can of UNIQUE Automotive Expanding Fire Stop Foam to seal the cracks, seams and openings in your firewall. 2.) Four (4) sizes of our Automotive Firestop Sponge Foam for the things that move in and through your firewall such as shafts and rods. 3.) Three (3) sizes of our Automotive Firestopper Sleeve Systems for your wires, cables, and hoses that breach the firewall. Not all vehicles are the same so you may want a Kit to start out and order individual components from this website as needed. Or for friendly, expert customer service, call us at 251-960-5018.